I've tried to capture most of the press, but there's always some that slip by. 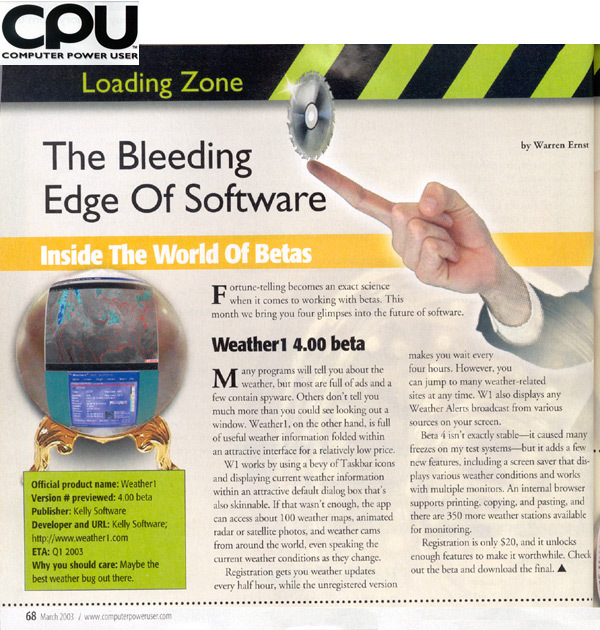 CPU, magazine, (03/2003) - click here to view article (159k jpg). Chicago Tribune, newspaper, (01/2003) - click here to view article. The West Australian, newspaper, 10/27/1998 - click here to view article. 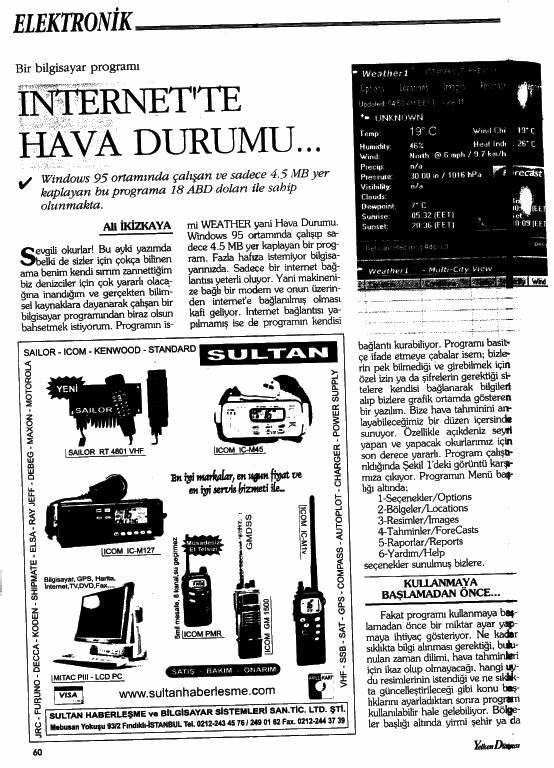 Smart Computing, magazine, 03/2001 - click here to view article. 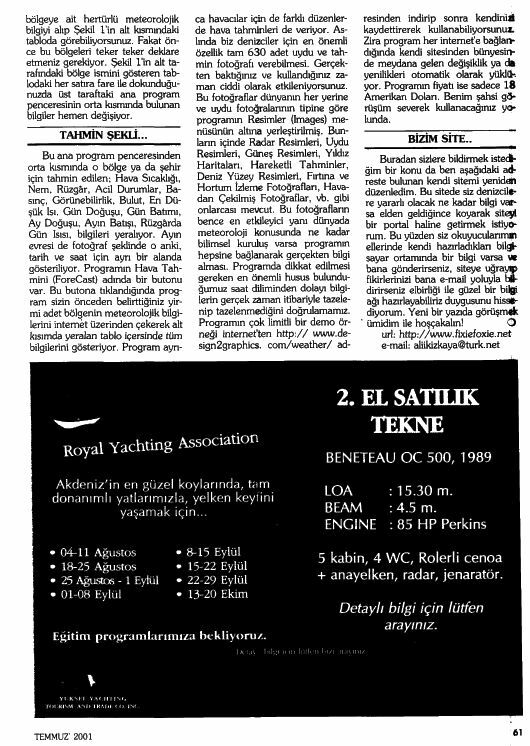 Sailing World, turkish magazine, June 2001 - first page, continued here. EXCITE.com - displayed this as their Daily Download on 10/10/1999, 11/28/2000, and 12/5/2000. Weather1 mentioned on TechTV! - 1998-2000. Weather1 has been listed in various software magazines all over the globe, including Spain, China, Japan, Russia, U.K., and others! ZDNet AnchorDesk - top story - 04/30/2002, 10/09/2000, 05/11/2000, 01/26/2000, 09/14/1999, 10/06/1998. Here's the link to the 04/30/2002 article but note that it may change since they change their site often. "Awards are given to products that we think are excellent and above average in their category. Awards are given based on our experience and judgement, and only to products which the majority of our reviewers agree deserve it." "This software product was tested in the Softpedia labs. Softpedia guarantees that Weather1 is 100% CLEAN, which means is does not contain any form of malware, including but not limited to: spyware, viruses, trojans and backdoors." Tucows - 5 cow rating!